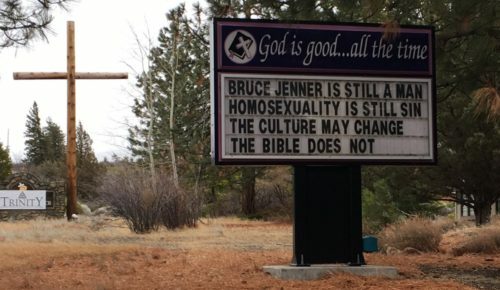 Trinity Bible Presbyterian Church is Lake Shastina, California, has stirred controversy in the town after posting an anti-LGBTQ sign in front of the building. The church, part of a conservative splinter group of the more moderate Presbyterian Church, has posted the sign previously, but this year locals have had enough. The rally, organized over social media, was “just a community effort to show that we actually care about all members of our community, regardless of orientation gender or other aspects of identity that make them unique,” protestor Robyn Vandiver told KTVL.